This spring, join the CFCArts Community Choir and Symphony Orchestra on a journey down the red carpet. Enjoy moments from award-winning shows of stage and screen from the past 50 years. You won’t want to miss this celebration of the best of the best! 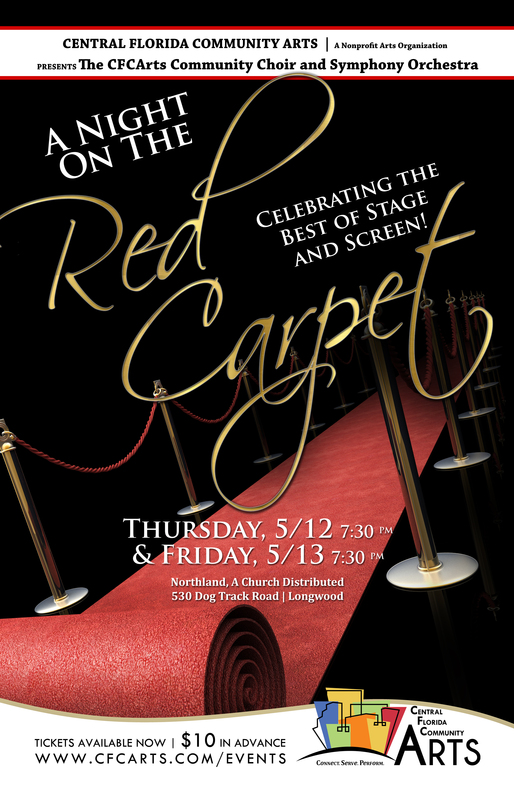 A Night on the Red Carpet will be held on Thursday, May 12th and Friday, May 13th at 7:30pm at Northland Church, 530 Dog Track Rd, Longwood FL, 32750. We are offering the convenience of assigned seating for this event! That’s right, you will be able to CHOOSE YOUR SEATS when you order your tickets to A Night on the Red Carpet! All seats in the auditorium will be assigned and will not be first come, first served. So buy your tickets now! Tickets are $10 each for advance sale ($15 at the door), Priority Seating tickets are $25 each, and tickets for Premium seating (which also includes a CFCArts Cookbook) are $50 each. Balcony seating is not handicapped accessible. For handicapped accessible seating, please call the CFCArts Box Office at 407-937-1800 x 710. Children ages 3 and under will be admitted for free. For those parents wishing for their 3 and under child to have his/her own seat, a free ticket will be available for reservation. Doors will open at approximately 7 p.m.
Nature’s Table Cafe will be open at 5:30pm both evenings – come early and join us for dinner!